Russia-backed militants shelled ATO troops’ positions using rocket and barrel artillery, various grenade launchers, anti-tank missile systems, and armor yesterday. “Militants committed a total of 23 ceasefire violations along the entire frontline. Ukrainian soldiers returned fire in 14 incidents,” reported Ukrainian Ministry of Defense spokesman on ATO Colonel Andriy Lysenko at a press briefing at Ukraine Crisis Media Center. In Donetsk sector, Russian proxies opened fire against Ukrainian positions 13 times. Militants had been conducting an intense attack near Vodiane and Talakivka after 08:00 using IFVs, grenade launchers, and machine guns and firing twenty 120-mm mortar rounds and the same number of 82-mm mortar rounds. The attack continued for almost 90 minutes. 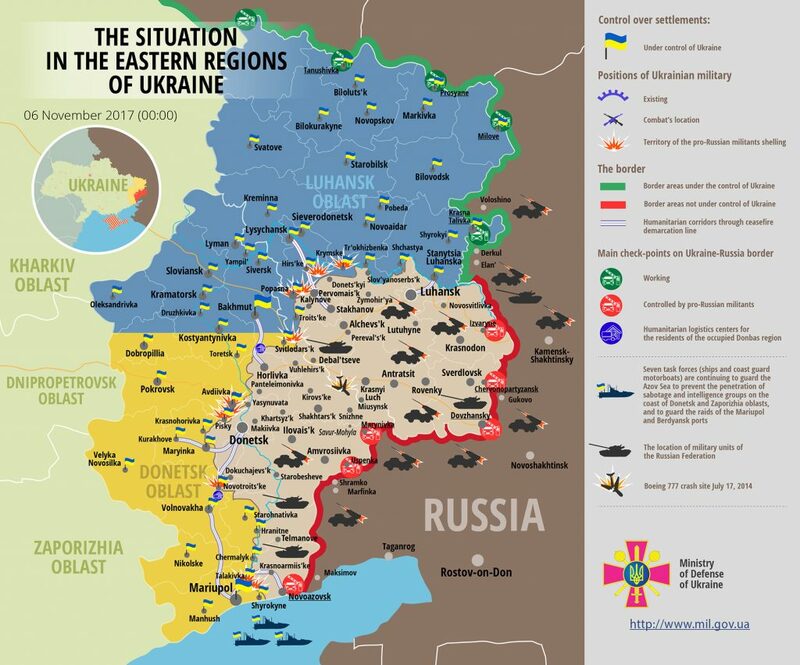 Ukrainian troops responded with the fire of mounted anti-tank gun and double-barreled antiaircraft gun. After 15:00 militants conducted almost concurrent Grad MLRS attacks on Ukrainian positions near Avdiivka and Opytne, partially hitting inhabited localities with rockets too. “Following this, Russia-backed militants used artillery against Ukrainian units near Pisky three times. The attacks involved various mortars and 122-mm barrel artillery. They fired a total of 90 artillery rounds at Ukrainian troops defending this town,” informed Col. Lysenko. Moreover, militants attacked Ukrainian positions near Avdiivka with mortars around 23:00, firing twenty-three 82-mm mortar rounds. Moreover, Russian proxies used anti-tank weapons near Hranitne. In additions, they attacked Ukrainian positions near Novotroitske and Bohdanivka with grenade launchers during the day. In Luhansk sector, militants attacked Ukrainian positions with aimed fire ten times. They attacked Ukrainian strongholds near Novotoshkivske with 120-mm mortars after 16:00 firing a total of 24 rounds. Ukrainian troops responded with heavy machine gun fire. “Around 21:00 the enemy had been attacking Ukrainian troops near Novooleksandrivka for almost one hour using IFV weapons, automatic grenade launchers, and small arms. Militants also fired six 82-mm mortar rounds. Ukrainian troops responded with an aimed fire of SPG-9 grenade launchers and small arms,” said the spokesman. Moreover, militants used IFVs at a stronghold near Popasna after 21:00. Ukrainian troops returned fire using IFV mounted weapons and mounted anti-tank grenade launcher. “Moreover, the enemy attacked our positions near Luhanske three times using various grenade launchers and small arms. The provocations ceased after Ukrainian troops gave a powerful response using heavy machine guns and 23-mm double-barreled antiaircraft gun,” added Col. Lysenko. Militants also attacked strongholds in the vicinities of Nyzhnioteple, Maiorsk, and Krymske during the day. Ukrainian Armed Forces suffered no fatal casualties yesterday, but two soldiers sustained injuries and were promptly taken to mobile military hospitals in Severodonetsk and Mariupol. Report on the military developments as of November 5 is available here. Interactive data on the shelling: chronology shelling chart and the interactive map.